Explore Madrid from the comfort of your vehicle and visit one of the three museums of the 'Golden Triangle of Art’. This tour has been designed for art lovers. We start with a panoramic tour of Madrid, and then you will have enough time to visit one of the three great art galleries in our city. Puerta de Alcalá - El Retiro park - Atocha station - Puerta de Toledo - San Francisco el Grande Basilica - The Cathedral - The Royal Palace - Puerta del Sol - Cibeles fountain - Thyssen museum - Neptuno fountain - Reina Sofía museum - Royal Botanic gardens - Prado museum. 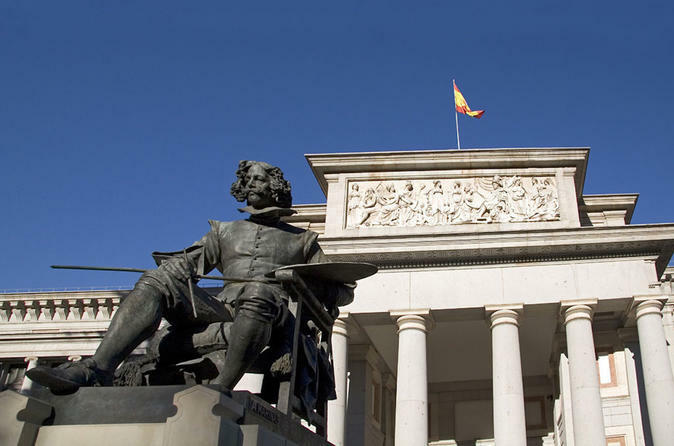 These are the three most important museums of art of Madrid. Please choose the one that interests you most to visit during this tour. The three museums described below are part of the so-called 'Golden Triangle of Art’ of Madrid. This is one of the finest art galleries in the world, the guardian of a great number of universally recognized masterpieces. A collection of 7,600 paintings, 1,000 sculptures, 4,800 engravings, and 8,200 drawings, though the museum currently shows around 1,000 works. This is a collection unique in Europe, consisting of extremely valuable works of the English, German, Dutch and Italian schools, and examples of different European vanguard movements, impressionists, expressionists, and American paintings from the second half of the 20th century. This is the most important exhibition space in Spain for international-level modern and contemporary art. The museum owns a valuable collection of Spanish historic innovations, and works by extremely important creators from the 20th century such as Picasso, Miró, Oteiza, Julio González, Tápies, or Juan Gris, among others.